Pictures are worth 1,000 words, right? If you believe that, stop here. The new Five Guys location at Hammock Landing in West Melbourne is large and includes outdoor tables. Florida in its awesome beauty, here. Good fast food isn't rocket science. But considerable mathematics - geometry, to be exact - does come into play. At McDonald's and Burger King, the burgers are round. At Wendy's, they're square. At all three, they're thin, dry and akin to waferboard - a composite of ground-up bits of beef. At Five Guys, the burgers have that Nickelodeon splat shape. They're formed by hand. They're juicy. 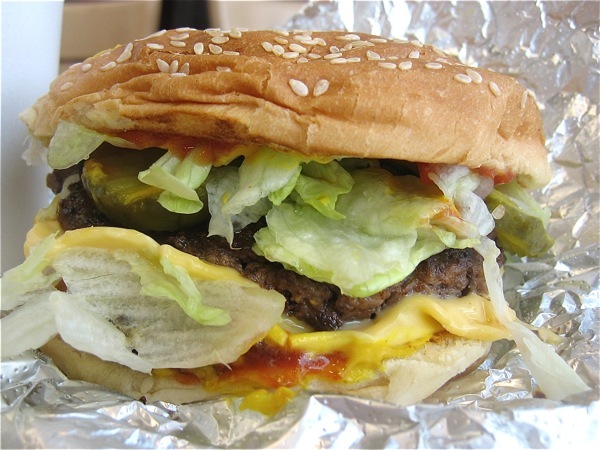 And instead of folding or sliding off the bun as they do at other fast-food joints, the burgers at Five Guys crumble. They have that back-deck cookout look, feel and taste. Above all, they're simple; no "special sauce" here. After moving from Washington, D.C., I missed the greasy comfort of a double-decker Five Guys cheeseburger. The chain started small in 1981 in Arlington, Virginia, just across the Potomac from the capital. But in the last five years, it has spread rapidly, now with 300 locations. Last month, GQ made Five Guys No. 1 on its list of 10 things to be psyched about because of its decade-long, 1,500-store expansion. And last week, Brevard County, Florida, got its first Five Guys Burgers and Fries. And I have to say, it's the biggest location I have seen. In D.C., the restaurants are cramped. Lines are out the door, onto the sidewalk. At the new Hammock Landing shopping complex in West Melbourne, the Five Guys features an open dining room with a high ceiling and plenty of room for bags of the peanuts that customers crack freely while they wait for their food. Unfortunately, the wait was an issue when I went Monday. After a painless two minutes in line, I paid $10.25 for a cheeseburger with pickles, lettuce, onions, ketchup and mustard (they're fully customizable), as well as a small fries and a drink. The cashier yelled my order to 10 people manning the grills and fryers. They looked like high-schoolers. Two reluctantly answered, "Got it." 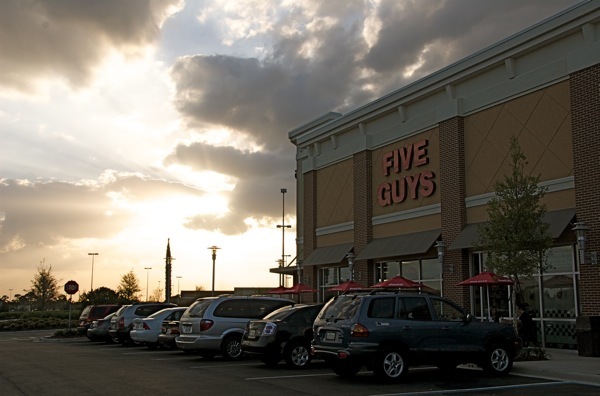 Five Guys believes in a transparency unsurpassed by the Obama administration. The burgers are cooked - starting from a raw patty - and constructed in front of an audience, the customers. But the burger-builders Monday were unsure and inexperienced. They slowly grabbed for lettuce, tomatoes, mushrooms, maybe a bottle of hot sauce, and deliberately applied them to a bun or atop a cheese-smothered patty. Customers lined the thigh-high counter that separates the kitchen from the dining room. The couple next to me tried to guess which of the partially constructed sandwiches were theirs. The manager assured us that, though the wait was long, the burger would be "the best you've ever tasted." I believed her guarantee; others looked suspicious. As one of my Facebook friends said, the interior "decor leaves a lot to be desired." Like the burgers, the furnishings are simple. The walls are accented with a checkerboard of red and white. Large red and white signs brag about the fame Five Guys has garnered (The Washington Post, Newsday, Zagat, you name it), offering customers another guarantee that the wait would be worth it. For 15 or 20 minutes, I waited. I looked over my shoulder, checking which table would be open when they called my number. I drank half of my Coke. The longest I have ever waited for a burger at Five Guys was five minutes. That was at Reagan National Airport after Barack Obama's inauguration in January. But when the West Melbourne crew called my number, 34, I wasn't disgruntled. 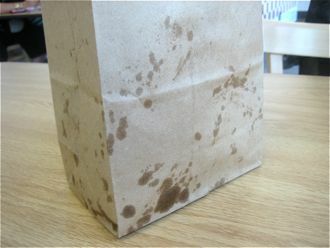 I was captivated by the brown paper bag, splotched with grease oozing from its contents. I sat, unwrapped the foil-wrapped burger and sunk my teeth into it. It wasn't warmed up. It wasn't waferboard; it was perfectly cooked beef. The bits of lettuce weren't strips pulled from a bag; they were ripped from a head of iceberg. The fries? Skins and all, they were soft, with crispy edges. They weren't sticks of batter with imitation mashed potato inside. Want some spice? 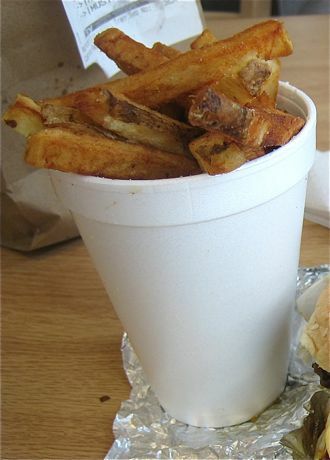 The Cajun fries are great, too (menu, locations). The manager was right; I'd rather wait at Five Guys than be handed a burger plucked from under a heat lamp at McDonald's, Wendy's or Burger King. And once its workers learn to move a little faster, Five Guys will give those circles and squares a run for their money. Update: This post has inspired dozens to make the trip to Five Guys. You're welcome, Five Guys. I went to the Five Guys in Waterford Lakes Sunday based on your article and let me say...it was quite an awesome burger. I've influenced a lot of people to go, and so far, everyone has liked it. I'm glad you did, too, Mark.